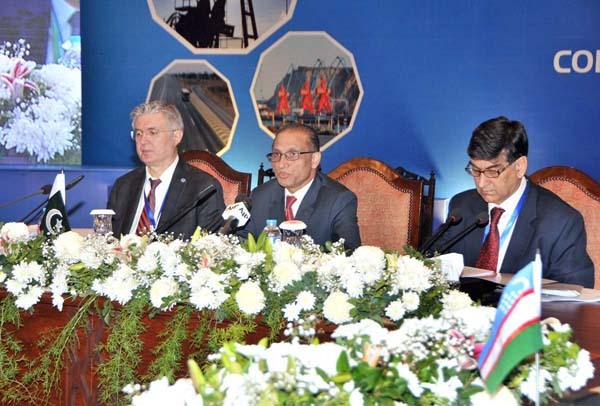 ISLAMABAD, Feb 26 (APP): Foreign Secretary Aizaz Ahmad Chaudhry Sunday highlighted the need to create a world-class logistics infrastructure within the Economic Coordination Organization (ECO) region for speedy movement of goods and people at a reduced cost that would stimulate investment and growth. Addressing the Senior Officials Meetings, commenced this morning, he said that Pakistan has always attached immense importance to the organization and its objective as demonstrated by our active role in the ECO. China-Pak Economic Corridor (CPEC) is a major initiative that would help achieve the core objectives of ECO, he said. This is a mega project which would benefit the entire region. The CPEC is anticipated as a game-changer not only in Pakistan-China context but it would also complement the economies of the entire neighbourhood, especially the ECO region, he added. He said the 13th ECO Summit has adopted the topical theme of “Connectivity for Regional Prosperity” as its key focus. The economic integration and connectivity are the main pillars to galvanize economic growth, create job opportunities, expand trade, improve competitiveness and usher prosperity in the region. He said the importance of trade figures show that ECO countries cannot be over-emphasized. Pakistan attaches great importance to its trade relations with the ECO countries and desires to significantly raise the volume of its trade with the member states, he added. ECO Vision 2025, he said, is an important document which would steer the Organization and serve as a roadmap for the success of the Organization in the coming years. Its emphasis on infrastructure development, facilitation of transit among member states and free trade would offer potential and practical remedies for the region’s socio-economic development. “We see the adoption of Vision 2025 as a step in the right direction,” he said. Peace in Afghanistan is very dear to us, he said. Pakistan is major affectee of the instability in Afghanistan and considers Afghanistan as its twin brother and fully supports the peace process in Afghanistan, he added. Chairing the session, he welcomed the members to Pakistan and said,”We are happy to host the 13th ECO Summit and look forward to advancing our mutual goals in the coming days, leading up to the Summit.” Pakistan has always attached great importance to ECO and will remain in the forefront for the actualization of its agenda, he added. As regards Scale of Assessment, he said some of the Member States including Pakistan have agreed to the proposal of ECO Secretariat. Pakistan is working out a plan in this regard, he informed. He also expressed his gratitude to the Permanent Representatives for diligently working on the draft and clearing almost 75% of the Islamabad Declaration. “The remaining paragraphs, I am confident, would be adopted in a spirit of cooperation, and mutual accommodation,” he added.